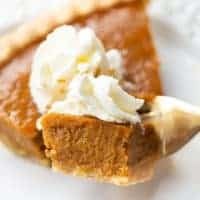 Classic pumpkin pie made gluten and dairy-free! In a medium bowl, whisk together all the ingredients for the filling until smooth and fully combined. Pour filling into the unbaked pie shell – pouring any extra filling into ramekins if needed. Bake for 15 minutes. Place a pie shield or tin foil over the top edges of the pie if desired. Reduce the heat to 350 F and bake for another 40-50 minutes until the custard is set. Cool on a wire rack for 2 hours. Refrigerate for longer storage. Enjoy! If your canned coconut milk has the fat as a solid on the top, scoop the solid/pour the solid and liquid parts into a glass measuring cup. Heat slightly in the microwave (about 30 seconds) so the solid part becomes liquid, whisk to combine. Then you can measure out the 1 cup of coconut milk needed for this recipe accurately.